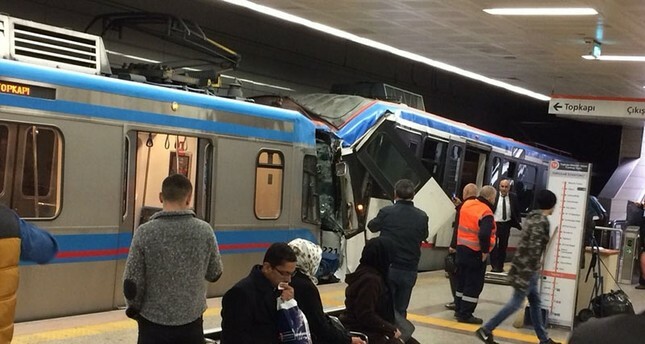 Two trams collided in the Topçular station of the T-4 Topkapı - Habipler line located in Istanbul's Bayrampaşa district on Thursday, leaving several passengers and the tram driver injured, reports said. A tram set rammed into another tram waiting in the underground platform. The tram driver of the set that collided with the other got stuck in the vehicle but was rescued by firefighter units. At least 13 passengers were also slightly injured in the incident. Tram services have been partially canceled between the Demirkapı and Bosna Çukurçeşme stations due to the accident, operator company Metro Istanbul said, adding that buses will serve in that section to transfer passengers between the two stations.